The very moment the wonderfully titled Thirteen Polaroids E.P. starts to pulse away you know you’re onto a winner – because a dirty old guitar solo zooms in and crashes all hope of a quiet moment away instantly. Quite frankly though, who would want a quiet moment when there is music like this to rock out to in whatever way you damn well feel like?! One major highlight is second track Saw, Drills and Glue Guns – it’s got the requisite electro-punk energy of the best of the scene and is listenable many times over without too much malaise setting in. (By which we mean, not much at all!) The E.P continues in the same high energy, electro-glossy vibe on the melodic but no less energetic Room 106. The six track count here is probably a very good idea (despite it being obvious this band could churn out much more in this vein to a very high quality) because there is literally so much going at times that you just have to let the metaphorical gun barrel of the music lead you where it wants. It’s rare to listen to a debut E.P in this genre that is so listenable on a repeat basis and on that basis The Dead Good, as we said previously, most definitely live up to their very cool name. Throw in the perfectly malevolent I Put a Spell On A You, a warning to a partner not to do anything stupid lest said spell should take effect, and the finale Through My Bones’ crunching riffs and twin vox mix and you have something that is surprisingly more than the sum of its traditional parts. 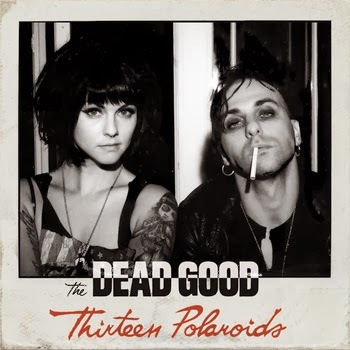 Electro Punk with the emphasis on P-U-N-K that is addictive and above all excellent!